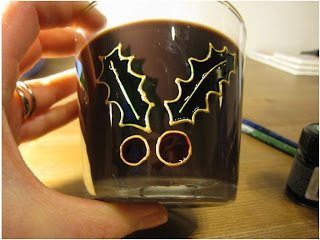 So for my first Mini tutorial I've been busy with a little glass painting as I think this is a great craft to get into; the materials are relatively cheap and you can get some lovely results quickly with only a little practice. 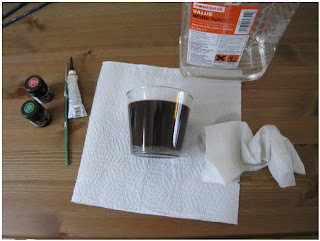 Most good craft shops will stock glass paints and outliner paste and you can also purchase them online (I've bought them from the UK based Lainesworld successfully before). You can either get paint that you just leave to dry or paint that becomes dishwasher safe after you've baked your finished item in the oven. 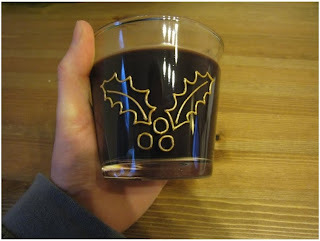 I've only used the more common non-baking paint as most of my projects are for more decorative items that don't need much regular washing, if I was to paint glassware then I would probably consider it. To start out with I would recommend seeing if you can find a sheet of acetate to practice painting on. You can put a sheet of white paper underneath it to make it easier to see what you are doing and because it is a nice flat surface you'll find the glass paint stays put nicely. After a bit of practice on acetate try painting up some jars from your recycling, if you can find jars with any flat faces (some of the posher jams come in cube like jars and are perfect for starting with) then be sure to have a go with these. Remove any labels that may be there if you are recycling old jars by giving them a good soak in hot water before pealing them off. 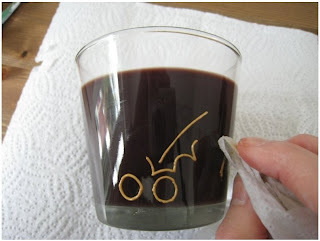 Using the white spirit give the glass a good wipe all over to remove any remaining glue traces as well as to get rid of any finger prints or other marks. Place your glass somewhere that it is secure (where it won't roll around) and be sure that you have good lighting so that you can easily see if you have applied enough paint. While holding the outliner paste in a position that is comfortable for you (I hold the tube like a pen) squeeze very gently until the paste starts to come out of the nib and then bring it down to the glass. Try to hold the nib slightly away from the glass as you can smudge it easily with the nib as it comes out of the tube. The technique is a little like icing cakes and it can take a good bit of practice to get a nice finish with the paste. You want to end up with a neat raised line of paste around the edges of your design as the glass paint needs to stay within your outline. If you make any mistakes while drawing out your design then you can easily wipe away the paste with a little kitchen roll dipped in white spirit. However, if that is tricky to do then you can also leave the paste to dry hard and then carefully cut and peal away the area with a sharp pen knife. Leave the outline to dry for a couple of hours before beginning to paint - or use a hairdryer to harden the paste if you have less time. You can tell the paste is hard by giving it a gentle nudge with your finger nail to see if you leave a dent. When painting with glass paints you want to fill the area that you have outlined with the paint in an even way. If you paint it to thinly then it will look streaky and the colours won't be as bright as they should be. If you paint it to thickly then the paint will drip over the edges of the outliner and go everywhere. Start by carefully loading up your brush with paint and then dab a blob of paint into the centre of the area that you are trying to fill. Use the paint brush to push the paint into each of the edges and when the paint starts to be too thin get another brush load from the pot. If you are painting a curved edge then you will need to keep the item moving so the paint doesn't all drip to one side. Blow gently on your work as you go to help it dry quicker and once one area is dry enough that the paint no longer moves about you can start on the next area. Some people find using a hair dryer on a low setting to help speed this drying also helps. Once you've painted all of your design then let the item dry for at least 4 hours before touching any of the painted areas, remembering to occasionally turn or move the item so that the paint doesn't get any drips forming while it dries. Now sit back and admire your handiwork and be sure to show it off to anyone you can! If you want to read more about glass painting then I highly recommend you finding a copy of "The glass painting book" by Jane Dunsterville (ISBN: 978-0715304280) - it's a great place to start and has all sorts of practical advice and tips in.